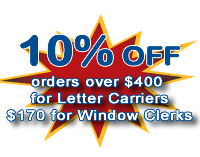 If you are a USPS City Carrier Assistant (CCA), Postal Uniforms Direct can accept your order either by fax, mail, phone or online!! Please follow the instructions below. Click here to complete and print the form to accompany your uniform voucher. NOTE: You can take a picture of your uniform voucher with your phone and email it to us. Make a list of the items you would like to order. For your convenience, click here to print the order form. Call our office using the information above. Email, fax or mail your voucher using the contact information above. Visit our online store and place items in your cart.